Malaysia’s dance of the seven veils has been a joy to behold. In the late 1970s and early 1980s it revealed its beach destinations to Ireland’s growing band of holiday hunters, Penang and half a dozen others whose white sand, palm lined beaches fill our brochures. Then we got interested in the exotic jungles of Sabah and Sarawak, the Borneo provinces – as far from peninsular Malaysia as Poland is from us. 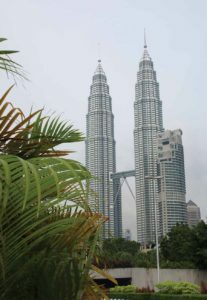 Nearly 15,000 Irish people a year now travel to Malaysia. But the one that was most familiar, the stopover destination of Kuala Lumpur, has been overlooked for what it is. Kuala Lumpur barely featured on maps, never mind traveller maps, until the 19th century. When Malacca was a famous destination, Kuala Lumpur was a river swamp, prone to flooding. The last 20 years has seen the rise of a new type of tourist destination, the Asian citybreak. The Asian citybreak was a creation of the stopover requirements of Aussie-bound airlines, but it has now got a life of its own, KL, as they call it, wanted to be top of the market. They built the signature attractions – the KL tower and the Petronas Towers, two of the tallest structures in the world. Tourists like an icon – here they get two of them. The KL tower comes complete with spectacular views, the revolving restaurant that creates at least one “where’s my handbag gone” incident every evening – it’s usually on the window sill at the other side of the room by the time you have finished the post-dinner Tiger beer). The Towers visit brings you to the viewing deck on the 38th floor between them, giving the viewer a unique feeling of being suspended above with KL spreadeagled below. This is a strange place to have such a built environment. The place is still true to its marshy heritage, and still floods in monsoon season. The rivers are, by necessity, filled with concrete culverts and drains. The two rivers that gave the city its name are now almost peripheral to the landscape, but they remind us all of their existence every rainy season. The swamp is buried under a city whose frenzied activity belies the heat, as market stalls mix it with massive shopping centres. The gadgets and computer centre is an attraction in itself. Chinatown, with its fake Rolexes and pirate DVDs is best visited in the dark, when the air is filled with bargains struck and tourists being persuaded to pay five times the going price for everything. Everything needs to be argued, even the top end malls expect you to haggle, about 20pc below the going rate. In Chinatown offer one sixth the price and endure the insults. It is worth it in the end. The charm of the city is that it is a stopping off point, not just for tourists, but for every aspect of Asian culture, every aspect of the world. It applies to its religion, its culture and most famously to its food, where peninsular Malay cuisine picks up influences from its Indian, Chinese, and European heritage. The Malaysian side cafes are like pubs in rural Ireland, full of character and eccentricities in their own right, staffed and patronized by characters and eccentrics. The conversations are long and unhurried, and the local delicacies are served with pride. The slow-cooked works of art served up by the amazing chef John Locke in Precious restaurant in Chinatown look too handsome to eat, but you will be glad when you do. The 2012 Asian Gaelic Games will be held at the Bukit Kiara Polo Club in Kuala Lumpur from Friday, 26 October to Sunday, 28 October, with 1000 players, representing almost 50 teams. Lake Gardens Park is a green oasis in the city.